An article published in the journal “Nature Physics” describes the results obtained with a series of simulations conducted using supercomputers at the Department of Energy of the USA’s Oak Ridge National Laboratory (ORNL). The object of these sophisticated simulations were proteins to understand their motion, a key element in the functional, structural and regulatory roles they have in living organisms. Three supercomputers were used to complete the simulations: the Oak Ridge National Laboratory has its own, called Titan, which on this occasion was joined by Anton of E.D. Shaw Research, built specifically for molecular dynamics applications, and Hopper of the National Energy Research Scientific Computing Center. 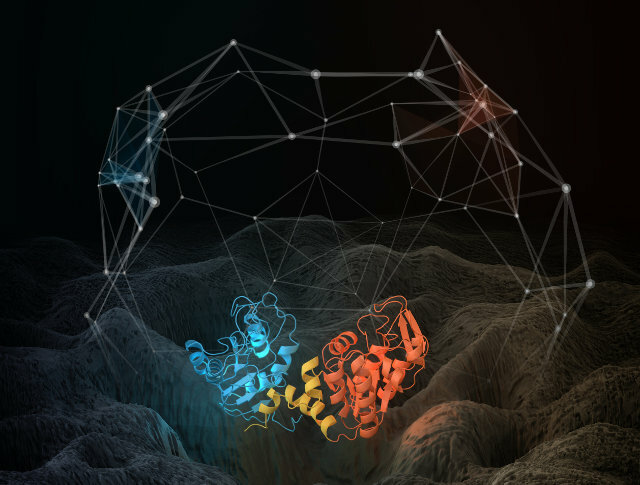 Complex simulations at molecular level are becoming important in biological research, including medical ones, to improve our understanding of how proteins work in living organisms. The complexity of biological systems requires huge amounts of calculations to reproduce their actions. The team led by Jeremy Smith, director of the ORNL’s Center for Molecular Biophysics, took advantage of all this processing power to understand the behavior of proteins such as phosphoglycerate kinase, an enzyme that catalyzes a metabolic process reaction called glycolysis. The protein is encoded by a gene so its copies are supposed to be the same. Instead, internal fluctuations of these individual proteins never converge and consequently don’t reach an equilibrium. This happens because the protein molecules undergo a continuous aging so they get quickly eliminated in the cell and replaced. Because of this complex process, two individual proteins don’t function in an identical manner in a cell even if they are encoded by the same gene. Jeremy Smith gave the example of two molecules of the same enzyme that catalyze the same reaction: because of the lack of equilibrium, that catalysis occurs at a slightly different rate for the two individual proteins. This affects the protein’s biological function. One of the discoveries concerns the shape change of the proteins following their motion. That shape was represented with a point and if it changes because of the motion it goes to a different point. Repeating that process and combining those points, the researchers discovered that the resulting images are the same regardless of the timescale considered. Research such as this one show how advanced technologies can help progress in fields such as medicine. Today, scientists can work with molecular models which in this case reproduce protein but may also reproduce a virus. In other cases they used physical reproductions created with 3D printers, such as in the recent research of a cure for Ebola. Technological progress is greatly helping these studies with results unthinkable not long ago.